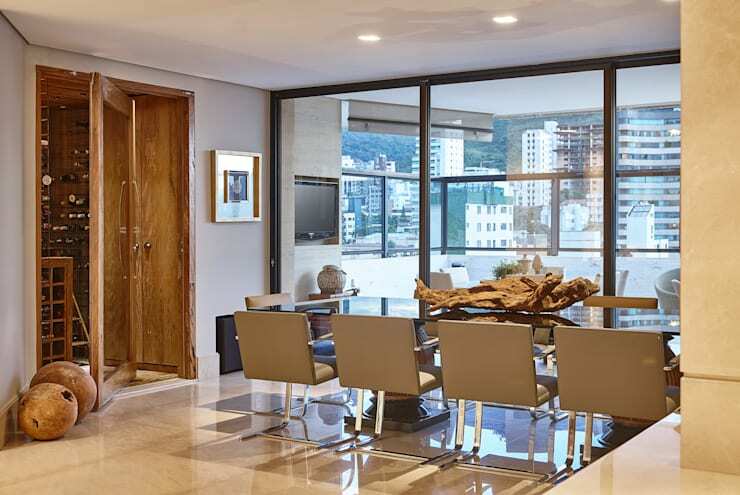 This extraordinary home is the creation of Brazil's magnificent Isabela Canaan Arquitetos, and incorporates the blend of luxury and eclecticism for which the firm's namesake is well known. The lofty dwelling presents the pinnacle of modern family living in the heart of a bustling city, with its expansive floor plan housing a stylish, open living area, space for both formal and casual dining, two kitchens and a courtyard with a small swimming pool—and that's just on the upper floor! The home is truly a wonder to behold, with luxurious finishes and furnishings characterising the decor, from leather and wood Scandinavian armchairs to the rustic indulgence of a wooden wine cellar, which looks out upon the dining setting to tease and tantalise. Best of all is the inclusion of a vibrant and playful room for children, with space for young minds to create and explore in an area devoted to arts and craft, or unwind in front of a film or TV show. All in all this home gives plenty of food for thought when it comes to luxurious family living. Take a tour of the images below and get inspired! 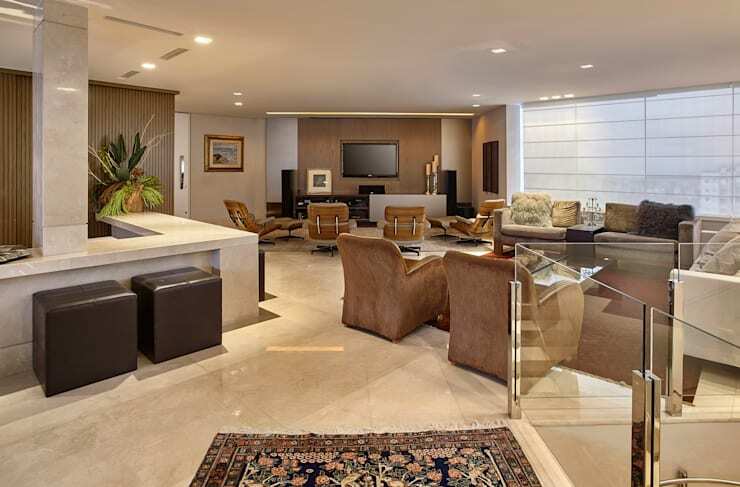 Upon ascending the stairs of this magnificent home we are greeted by an open and expansive living area dressed in luxurious, contemporary furnishings. Large windows frame the space, inviting natural light to circulate and illuminate the pale tones of the stone tiles and white of the walls and ceilings. Leather, wood and textile are also prevalent, with a range of textures and soft colours combining to create a relaxed and welcoming atmosphere, exuding the very essence of luxurious living. This view of the living area displays two distinct spaces: one designed to capitalise on a state-of-the-art multi-media system, and another situated by the expansive windows framing the home, designed to accommodate casual entertaining and relaxation. The contemporary, Scandinavian armchairs seen here immediately add an element of luxurious intrigue within the room, with their combination of leather and wooded finishes impressing with modern style. The more relaxed lounge suite in the distance appears inviting in its cushioned comfort, with a stunning view filtering through the light, white blinds shielding the windows. 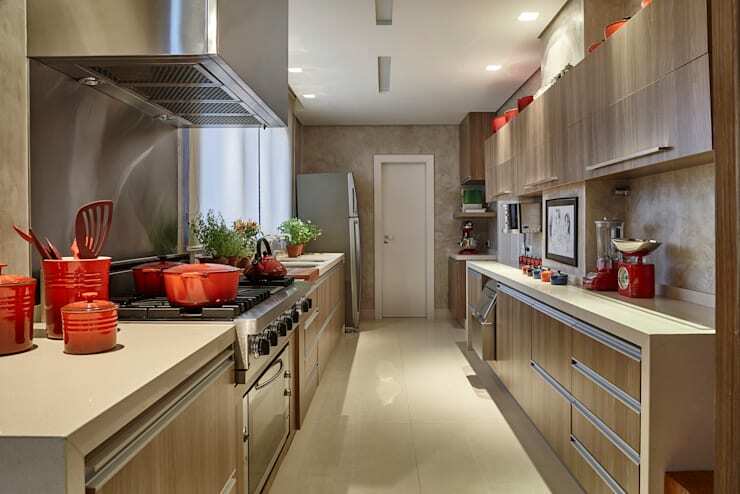 The kitchen of the home appears warm and sophisticated, with woodgrain finishes combining with the sheen stainless steel to beautiful effect. A smattering of red objects enlivens the colour scheme, with an expansive stovetop and oven included to accommodate the culinary whims of the occupants. The entire space is at once contemporary and character-driven, with homely elements such as the array of fresh herbs on the bench tops and the black and white illustration adorning the right hand wall softening the contemporary edge of the decor. 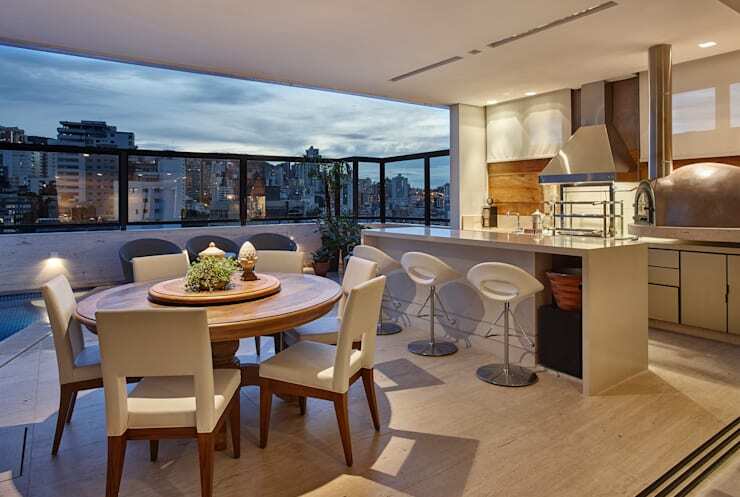 Adjacent to the kitchen rests a dining setting, with contemporary, leather chairs lining a large, glass-topped banquet table to create a simple, sophisticated scene. A view of the surrounding city adds a vibrant colour contrast within the space, which has primarily been decorated in soft, brown tones. The use of wood is prevalent here, from the gnarled, driftwood centrepiece on the dining table to the rustic finish of the wine cellar, from which bottles peer out to tease and tantalise guests and residents. The home isn't limited to a setting for formal dining however, with this smaller, more casual space also included to capitalise on the property's lovely courtyard and beautiful view. Contemporary furnishings and finishes once again prevail, with white and wood lightening the colour scheme relative to the browns of the formal dining area. A second kitchen has also been constructed, designed within contemporary finishes in mind and housing a wood-fire pizza over for the penultimate in relaxed, casual dining. 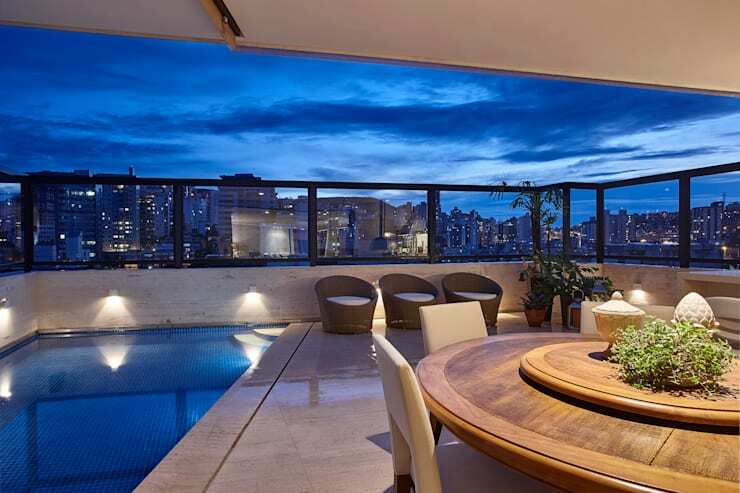 The area blends beautifully with the outdoors living space, taking advantage of the warm, Brazilian climate. Moving further afield and we can get a sense of the inviting opulence of the home's courtyard, which rests resplendent in the soft colours of its stone tiles and simple furnishings. An array of pot plants refresh the space with hints of nature, with the focus being the pristine water of a small pool and the rolling scenery of the city beyond. 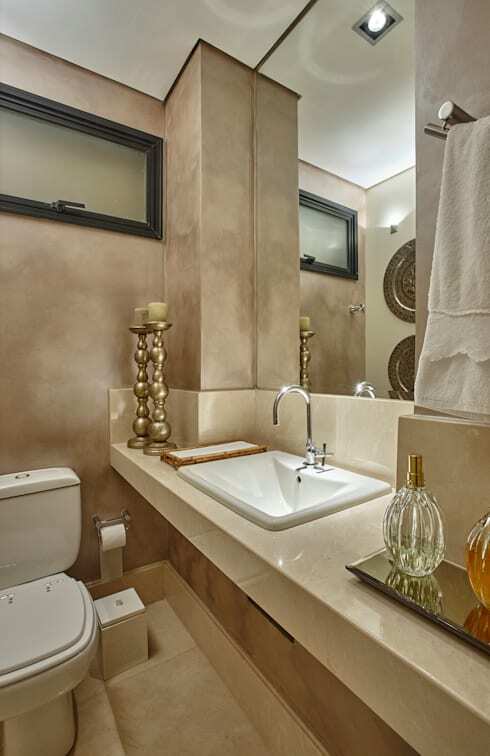 The bathroom of the home continues the opulent colour scheme of soft, brown stone, with the sheen of the sink and flooring offset by the matt finish of the textured walls. An expansive mirror has been incorporated to instil a sense of depth within the room, with its surroundings decorated by a range of luxurious artefacts, from the bottles of a bespoke perfumer to a set of gold-finished candlesticks. The master bedroom departs from the opulence of the home's living quarters, presenting a cosier, more homely appeal with its floral patterned bedspread and wallpaper. The decor of the room has primarily been kept subdued, as evidenced by the white of the ceiling alongside soft, timber flooring and the pale hue of the wallpaper. 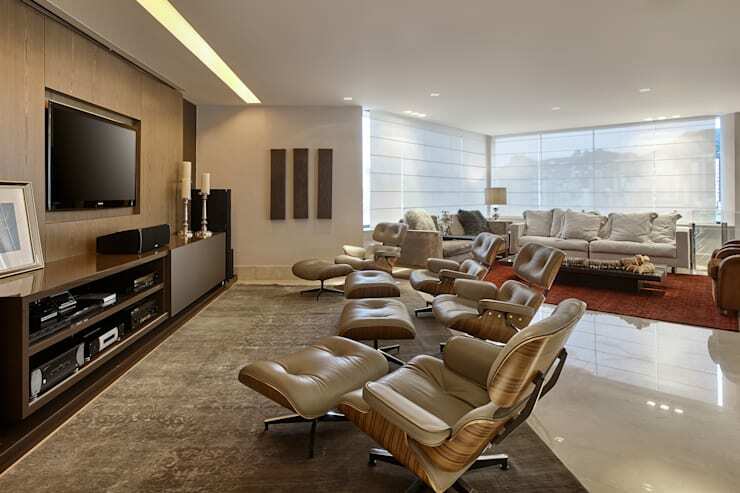 A mounted television and built-in robes have been included for luxurious functionality, with the whole room appearing casual, comfortable and inviting. This room presents a novel addition for a luxurious family home, with its colourful furnishing and decor creating the vibrant environs of a children's playroom! A striped feature wall, coloured shelves brimming with toys and an arts and craft space provide the perfect setting for creative fun, while a small, purple sofa sits ready to accommodate some relaxation in front of a movie or television program. Looking for more ideas to decorate your modern, family home? Check out A Well Appointment Home and get inspired! Would you like to take up residence in this beautiful, family home? Tell us why below!